Half a century on, a lot of things have changed. 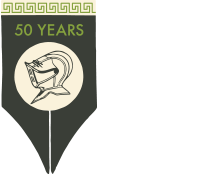 In the 50 years since St. Norbert launched its first college magazine, the alumni world has gone from black and white to color; hot metal has gone to offset lithography; Knight Life has grown from its original 12 pages to its current standard 36. Your magazine has changed its name once, its format three times and its design at least seven times. Its mission, though, remains the same. It has always been this: to connect alumni friends with the college they once called home. The mix of content is essentially unchanged, too. Since the very first issue, there’s always been news of faculty research; new developments in technology (“the IBM 1130!”); fundraising, facilities, athletics; a nascent calendar of events; and, of course, a busy section of alumni notes. Revisiting the May 1967 issue even reintroduces us to old friends in their younger selves: Dudley Birder (Music Theatre), for instance, whose 90th birthday is celebrated in this current issue gets a mention on page 9 of the May 1967 issue – “cited by the De Pere Chamber of Commerce for his cultural contributions to the community.” Fondly remembered campus figures appear in the 50-year old pages, too, among them Neil Webb, newly named as the college’s first administrative vice president. (He would become president of the college six years later). And, people like Bill Bohné (Art) (whose sculpture in wood was shown in the 53rd Wisconsin Painters & Sculptors show, page 7); Mel Nicks (honored on page 8 as Man of the Year by the Wisconsin Catholic Interscholastic Athletic Association); and the Rev. Anselm Keefe, O.Praem., Class of 1916 (whose collection of more than 13,000 plant specimens is the subject of an article on page 10 – and more recently, was celebrated in our Summer 2015 Issue). 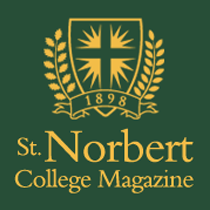 The name change from Knight Life to St. Norbert College Magazine would come in 2002, when the periodical committed to four-times-per-year publication, 32 pages and something close to its current format – with news of the college in front, a slate of features in the middle and alumni news in the back. But issue and volume numbering have continued essentially unbroken to the present day, which is why we can say as we deliver this latest issue, Happy Birthday to us! Alumni Notes has run consistently since the first issue of this magazine. In May 1967, we included word on alums stationed in Vietnam (Col. Kenneth Simmett ’41, Capt. Norman Jarock ’58, Lt. Robert O’Brien ’64, 1st Lt. Robert Roix ’64, 1st Lt. William O’Connor ’65, Lt. Alan Skaleck ’66, Jack Francis ’67) and with the then six-year-old Peace Corps (James ’63 and Lynne Luicia ’61 Poprocki in Micronesia and Roger Burbach ’65 in Peru.) The issue noted changes of address from alums with years of graduation dating back as far as the early years of the 20th century (William Sanders ’14); and news of some other old friends: the Rev. Rowland De Peaux, O.Praem., ’48, recovering after a car accident, and college trustee George Hartman ’64, sharing his Connecticut and Wisconsin addresses. We enjoyed insights into life at St. Norbert in the late sixties; technologically aware, theologically inclusive, student-focused, life-affirming – Catholic, Norbertine, liberal arts! Dipping into our first issue gives a fascinating glimpse of campus life back in the day. 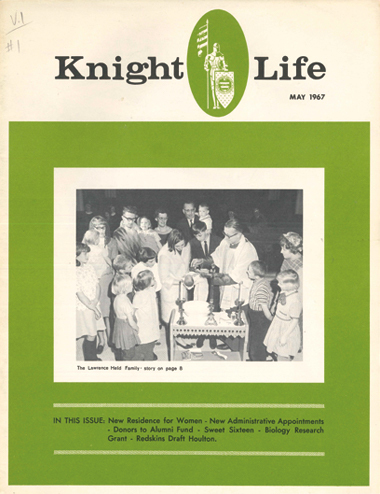 Our early issues are archived and available to read online at digitalcommons.snc.edu/knightlifearchives. Knight Life became St. Norbert College Magazine in 2002. Online content was added in 2008. That same year saw the launch of the magazine's page on Facebook – making it one of the first half-dozen college magazines in the country to debut on a social media platform.